Mushrooms have been a highly prized delicacy throughout history. Some cultures believed that eating mushrooms made a person immortal. 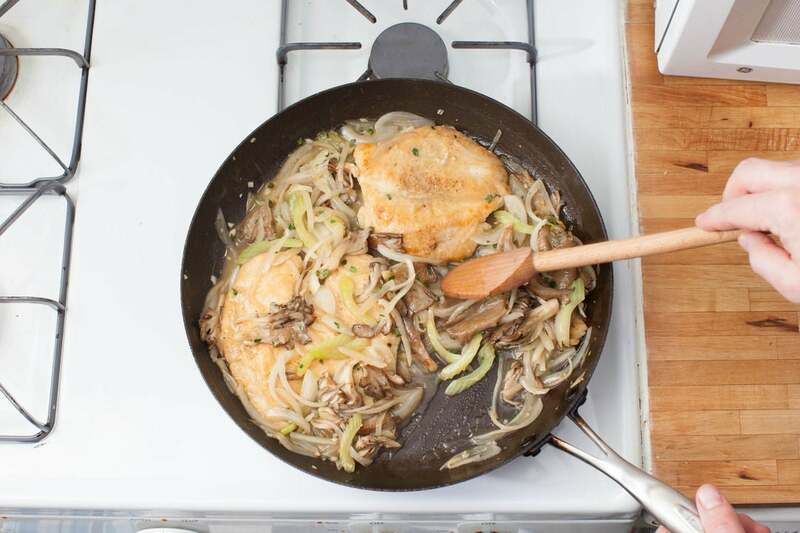 We think their delicious, earthy, umami flavor is the perfect companion to the simplicity of crispy chicken in this dish. Foraging, hunting for mushrooms in the wild, can be fun and rewarding if you know what to look for and where to find it. If you don’t have the time to forage, just look in this box. We’ve done all the legwork for you! Preheat the oven to 400°F. Wash and dry the fresh produce. 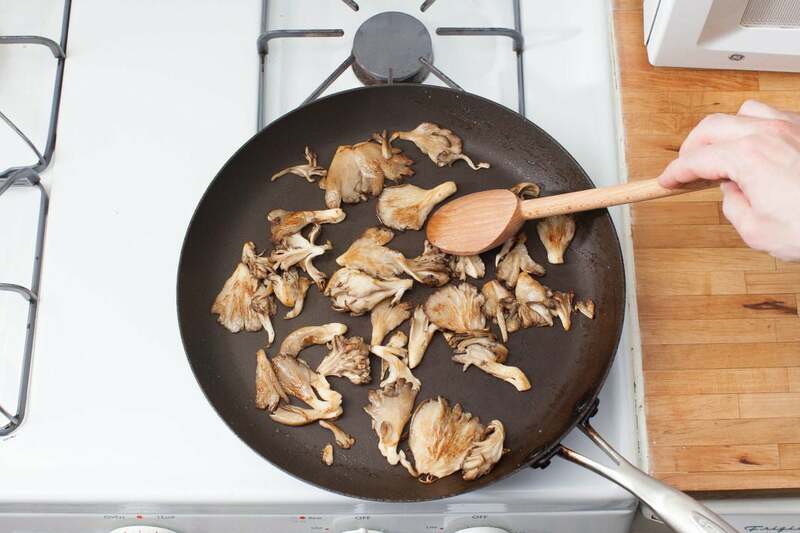 Slice the maitake and oyster mushrooms into bite-sized pieces. Peel both garlic cloves. Leave 1 clove whole; mince the remaining clove. Pick the lemon thyme and parsley leaves off the stems; discard the stems. Roughly chop the parsley leaves. Slice the bread in half horizontally. Thinly slice the celery on an angle. Peel and thinly slice the onion. 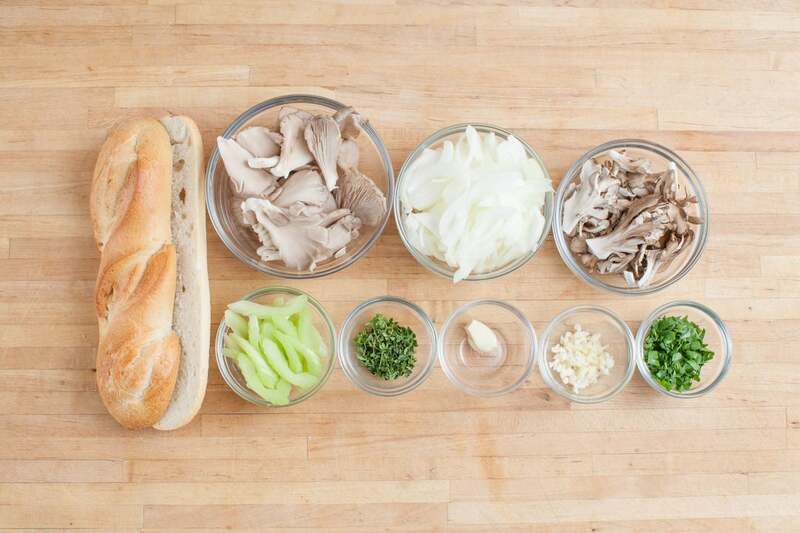 Place the sliced bread on a sheet pan, cut side up. Drizzle with olive oil and season with salt and pepper. Place in the oven and toast 5 to 7 minutes, or until lightly browned. 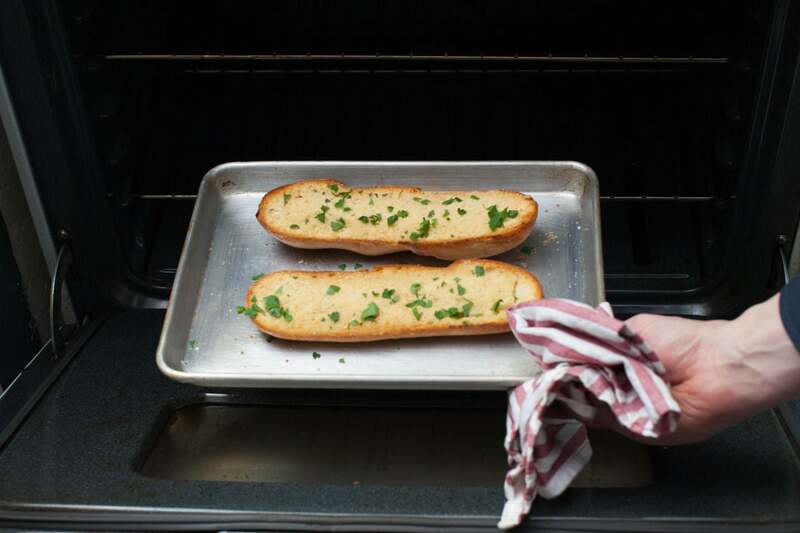 Remove from oven and carefully rub the cut side of the toasted bread with the whole garlic clove. Generously sprinkle with the Parmesan cheese and half the parsley (save the rest for garnish). Return to the oven and bake 5 to 7 minutes, or until the cheese is melted. Remove from oven and set aside as you finish cooking. While the bread toasts, season the butterflied chicken breasts with salt and pepper, then thoroughly coat with the flour. In a large pan (nonstick, if you have one), heat 2 teaspoons of olive oil on medium-high until hot. Shake any excess flour off the coated chicken breasts, add them to the pan and cook 2 to 3 minutes per side, or until browned and cooked through (the juices should run clear). 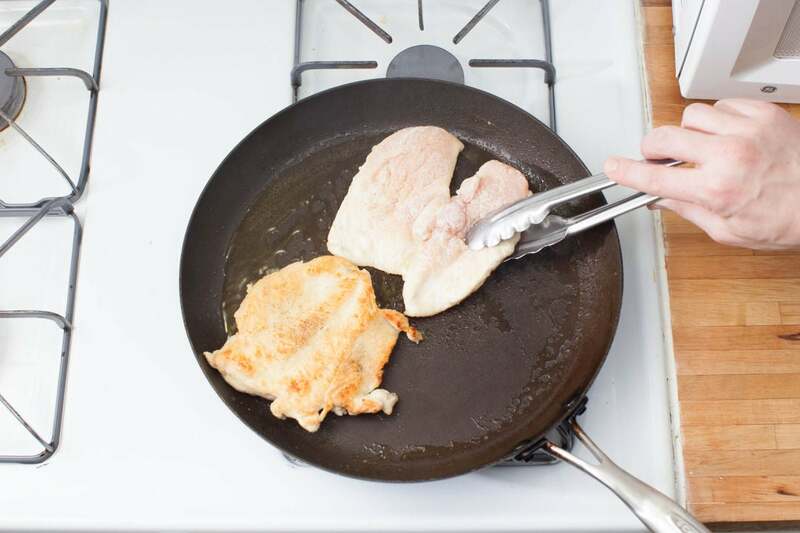 Transfer the cooked chicken to a plate, leaving any drippings in the pan. Set the chicken aside in a warm place while you continue cooking. In the same pan, heat the reserved drippings on medium-high until hot. Add the maitake and oyster mushrooms in a single, even layer. (Make sure the mushrooms aren’t overlapping so they caramelize evenly). Cook, stirring occasionally, 3 to 6 minutes, or until browned and caramelized. Transfer the cooked mushrooms to a plate. Wipe out the pan. In the same pan, heat 2 teaspoons of olive oil on medium until hot. 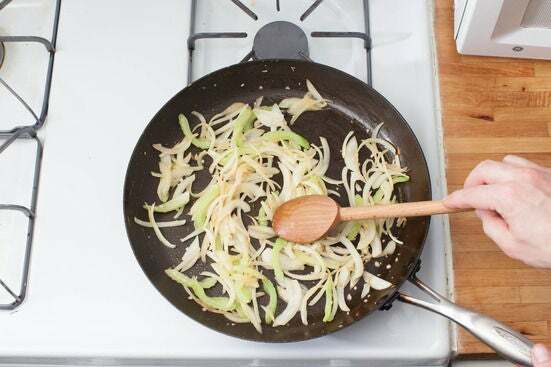 Add the minced garlic, celery and onion. Season with salt and pepper and cook, stirring frequently, 4 to 6 minutes, or until softened and fragrant. 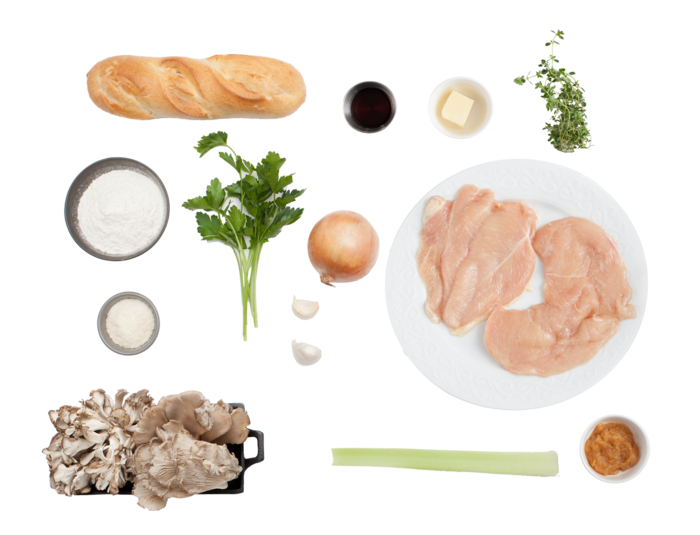 Add the cooked chicken (along with any juices on the plate), cooked mushrooms, lemon thyme, butter, chicken demi-glace, sherry vinegar and ¼ cup of water to the sautéed aromatics. Cook, stirring occasionally, 2 to 3 minutes, or until slightly reduced in volume. Remove from heat. To plate your dish, cut each piece of garlic bread in half on an angle. 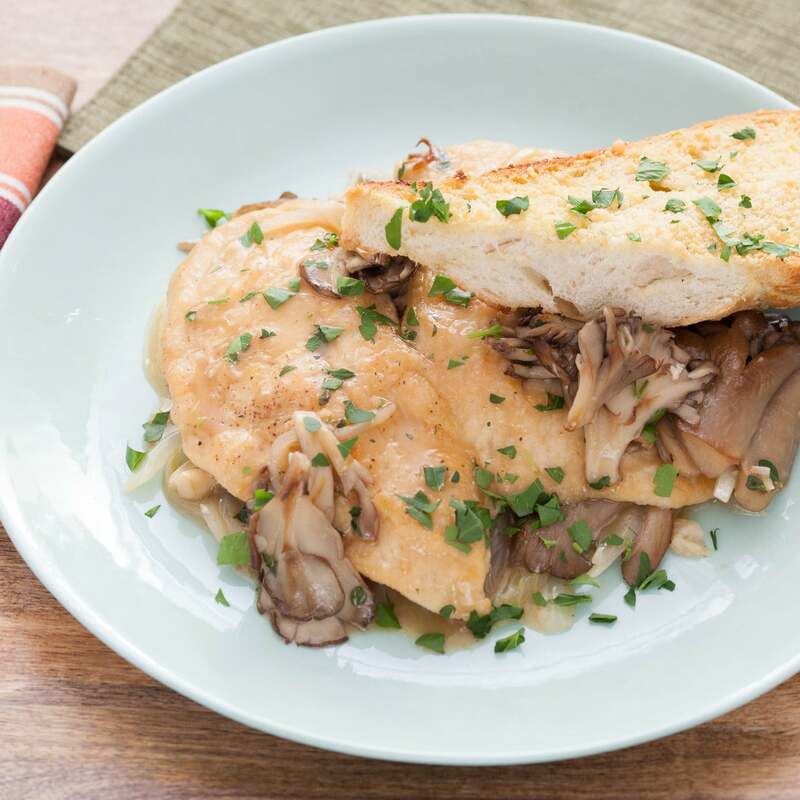 Divide the cooked chicken breasts and mushrooms between 2 plates and garnish with the remaining parsley. Serve with the garlic bread on the side. Enjoy!